On February 27th, Maywood leadership students went to Metrotown to spread kindness. They treated customers to coffee and treats, they held doors open, they shared kind words and found other ways to bring cheer to people. 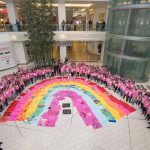 With 7 other schools, they created a rainbow of messages to take a stand against bullying and to raise awareness.